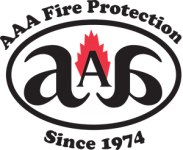 AAA Fire Protection Services provide expert level fire extinguisher services to Burlingame businesses and businesses throughout the entire San Francisco Bay Area. With over 40 years of experience helping businesses comply with the California Code of Regulations and Title 8, Section 6151 we've become a leader in fire protection services. By offering outstanding fire extinguisher services at affordable rates, we are able to help businesses of all sizes comply with California's fire code. Our fire extinguisher services exceed the expectation of California's code of regulations. We inspect fire extinguishers every year and we track when and if they need to be recharged. We see fire extinguishers every day that won't function if they were needed. Recharging occurs because, without that service, fire extinguishers don't work. We understand that fire extinguishers are the very first line of defense for your business. This is why we also offer fire extinguisher sales. Small fires can be completely put out with the use of a fire extinguisher - but only if they work. If you're ready to work with a professional company, give us a call at (800) 543-5556. We will happily answer your questions, provide a quote, and if needed schedule walk-through of your business.